It has been way, way too long since I posted anything. I just haven't had anything new I've been excited about, and I don't want to post anything new just for the sake of having new stuff. But I've come up with a few new things lately that I think are quite good and worth sharing. This first one is Turmeric Tea. (Turmeric with *2* r's, not just 1 - as in TUR-mer-ic, not TOO-mer-ic.) I really, really, really like this stuff. My plan is to drink it near daily, year-round, not just when the weather starts to turn cool through the wintertime. My particular recipe is meant to be drunk hot. (From what I've seen online, most, if not all, other recipes are as well.) While I'm sure it would taste fine iced, the particulars of my recipe don't allow for it, as you'll see. I may play around with an iced version at some point, but for now I'm as happy as I could be with the one I've got. 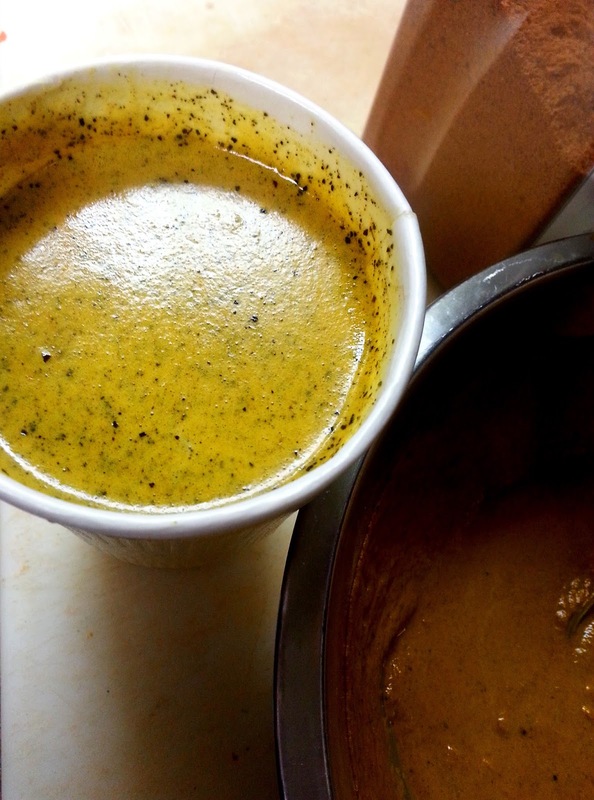 If you've never had Turmeric Tea before (aka Turmeric Milk or Golden Milk), I highly recommend you try it. Besides its many purported health benefits (antioxidant, anti-inflammatory, immune booster, digestion, liver health, and possibly cancer, among others) it just tastes really, really great. Even if you have had it before, I'm pretty sure this particular recipe trumps all others out there. To be honest with you, the taste is really why I drink it; any health benefits are just bonus for me. Ok, let's start with the paste. It's pretty straightforward- start with the ground turmeric and add *about* a cup and a half of hot water to make a paste. You may want more or less depending on how thick you want the paste to be. Add in the other spices. As for the black pepper, I use a Magnum grinder and I just add in about 10 cranks on that. With other brands of pepper grinder, you may want to adjust the amount a bit higher or lower, depending on how big your grinding mechanism is. The main thing is to definitely have black pepper in your turmeric tea; it increases the effectiveness of the health benefits. And just in case you're thinking of leaving out the cayenne because 'you don't like spicy stuff,' please don't. At least try it as written just once. It's not spicy hot at all, I promise. And cayenne has been gaining attention lately as having its own health benefits for us, so bonus points for that. For the tea- I personally almost always use, and highly recommend, guayusa. Honeybush also works very well. To be honest with you, those are the only two I've tried, so I don't know how other teas or liquids might work. If I was to try something else, I'd go with a good Indian black tea, followed by just any regular black tea, and then water. So, brew your tea as normal (for guayusa, I use 1 T guayusa per 8 oz water), then add 2-3 T of the paste, the honey, coconut oil, and salt. Next you're going to want to blend it for about 8-10 seconds, preferably with a stick blender, but a regular blender is fine too. If you have a stick blender, maybe use a larger-than-normal container to brew your tea in, so you don't have to transfer it over to something else in order to blend it. If you don't have a stick blender, just take your tea/spice blend and pour it into a blender and blend on high for about 8-10 seconds. Pour into your mug of choice, add about a half cup of hot soy/almond/whatever* milk, and prepare to be blown away. I recently made a version of this and added fennel seeds, nutmeg, and a few cloves. It was probably the best version of this that I've had yet. I don't remember the amounts, but I'd probably go with a teaspoon of each and experiment with that. *ok, me personally, I love, love, love dairy. But I've never considered, and probably never will consider, using dairy in my turmeric tea. It's always been soy/almond/coconut/whatever. Don't know why, that's just my thing for this stuff. Just know that I can't vouch for how dairy tastes in this drink.